LIFTED: Under the Tree is a new show from aerial theater company Suspended Cirque—think Toy Story meets Fuerza Bruta. 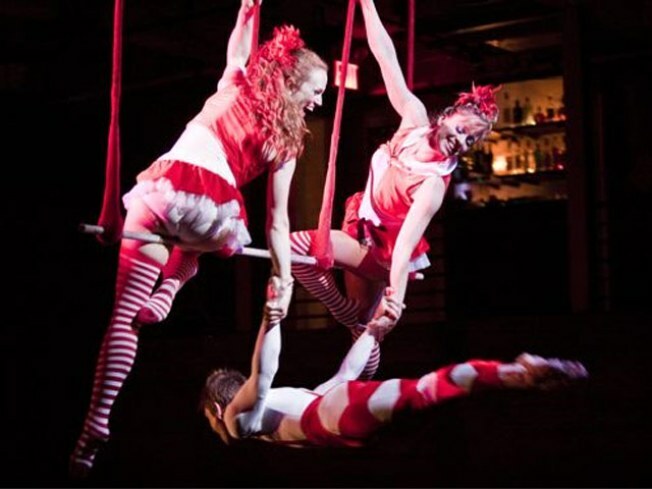 A cast of toys comes to life, each playing out his or her neuroses through aerial choreography with hoops, trapezes and such, as you sip cocktails in the massive Galapagos Art Space below. 8PM, also on Thursday. GET SOME CHURCH: We love a good Nutcracker or Messiah as much as the next person, but sometimes, the spirit of the holiday makes us want to let down our hair. For that, there’s Black Nativity Now, a soul-stirring gospel musical that tells the story of the birth of you-know-who set in a church in the middle of a (seedier, old-school) Times Square. At the Theatre at St. Clement's, 423 West 46th Street. 7PM; through January 2; schedule varies. FOCK YEAH: The official get-the-family-out-of-the-house-to-the-movies film of the holiday season lands today: Little Fockers sees the Meet the Parents clan reunited with a couple of notable additions: Ben Stiller and Teri Polo have five-year-old twins, and Barbra Streisand (as Roz Focker) is rocking a perm the likes of which we haven’t seen on her since A Star is Born.Showtimes here.